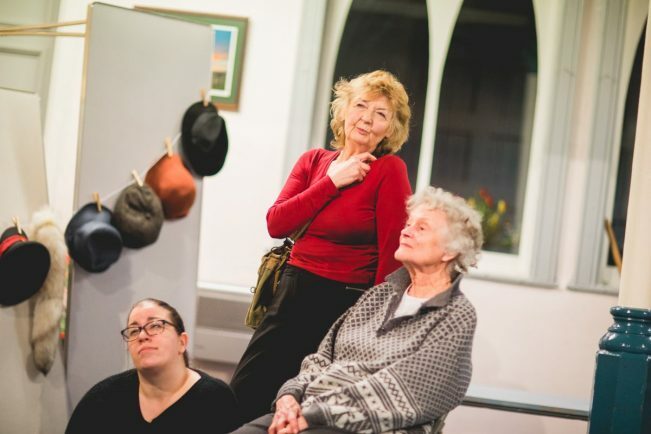 Girls centre stage in Lilies of the Land at Stratford's Bear Pit Theatre. Land Lilies - Olivia Jane Parker (Annie) Anne O’Neil (Gracie) Shirley Allwork (Beryl). THE GIRLS are centre stage in Lilies of the Land at Stratford’s Bear Pit Theatre. The play, directed by Lindsey Allwork, focuses on the women who signed up to join the Women’s Land Army during the Second World War. Based on 150 letters and interviews with original Land Girls, along with songs from the period, Lilies on the Land charts the personal journeys of four women who join the Women’s Land Army – determined to work endless backbreaking hours on farms across the country in a bid to do their best for the war effort. But how do these women, all hailing from different walks of life, torn from their families and bereft of all basic home comforts, deal with the hardships of farming life and the pressures of war? Maybe work clothes full of mice and toilet rolls falling from the sky are just what it takes for these girls to get through. The production runs from April 17 to 21. Visit www.thebearpit.org.uk for tickets and further details.